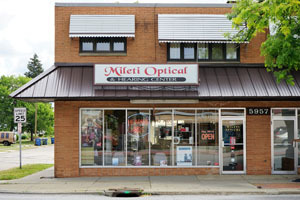 "Family owned and operated Mileti Optical & Hearing Center was Established in 1961"
The founder, Sam Mileti, opened the family business with basic business principles. Built on the foundation of ideals Sam lived by and passed on to his sons Mark Mileti and Victor Mileti. These ideals are based on friendly service and quality products at competitive prices. Together Mark and Victor have 60 years’ experience with precise fitting and expertise. At Mileti Optical & Hearing center we offer eyewear and hearing aids to fit most budgets. We have a large selection of the latest fashions in eyewear and the latest technology in hearing aids. We have a large selection of eyewear frames in the latest styles such as Ray-Ban, Silhouette, Safilo, Vogue, Aspex, Versace, Luxotticca and more. We accept Eye Med Insurance.